Don’t overlook container gardening with bulbs. You’ll get a head start on spring bloom time! Lilies, tuberous begonias and caladium all start from bulbs as do the spring flowers we always think of when planting bulbs – tulips (below), daffodils and crocus – to name a few. 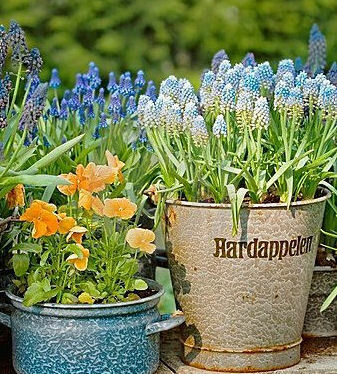 Get a jumpstart on your gardening by planting bulbs – they do great in containers. Buy mature plants that have already sprouted and transplant to containers. Bulbs are often sold loose so you can see what you are getting. Look for firm, well formed bulbs that feel a little heavy for their size. Don’t purchase bulbs that are soft, yellowing or bruised. The bigger the bulb, the more nutrients it holds and therefore, the bigger the bloom should be. When weather warms, move your pots outdoors in the afternoon and bring them in at night until all signs of frost have passed. This promotes healthy plant growth. 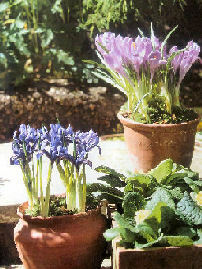 When container gardening with bulbs, start the bulbs indoors 4 to 6 weeks before the last expected frost in you area. Generally, late January to mid February is a good for starting bulbs. Use a container with adequate drainage and fill it part way with potting mix. Position the bulbs in the pot with pointed sides down. Plant to the depth that is indicated for the particular plant. Plant bulbs in clusters and close together when you’re planting a container garden so you will have maximum bloom impact. Cover the bulbs with soil. Water thoroughly with warm water. Warm water will promote germiiation and keep the soil warm. Set the pot in a warm location and move to a sunny window as soon as new growth breaks the soil. Keep soil moist, but not soggy. When the weather warms a little, move the containers outdoors in the afternoons and bring them back indoors overnight. This will promote sturdy plants. Once all threat of frost or freeze has passed, you can move the pots outdoors to stay. To save bulbs for next year, allow the leaves to die and then dig up and store in a cool dry place. Plant again in fall to have blooms next spring. In the North, successful container gardening with bulbs will require full sun. In the South, for longer lasting blooms, locate bulbs in partial sun. Flowering bulbs don’t need fertilizer when planting – lots of stored nutrients are retained in the bulb. For a long season of bloom, plant early, mid-season and late varieties in the same pot. Or mix different types of bulbs in the same container. Plant in layers, with the biggest bulbs deeper. If you live in a climate with mild winter, plant cool season pansies or violas on top of the bulbs and put your pots outside immediately. When planting bulbs, check for height expectations and plant accordingly. When you plant different bulbs in the same pot, plant taller ones in the middle and the shorter ones near the edge. 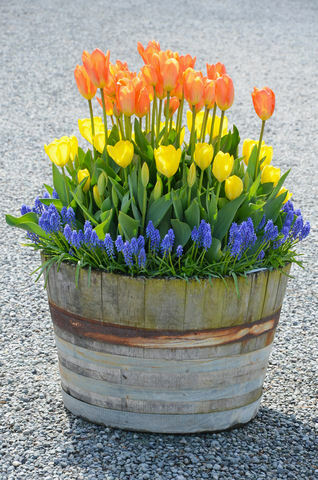 By planting bulbs in container gardens at different depths, you can stagger the bloom period. The deeper you plant, the later the bloom. In mild winter climates, try refrigerating some of your bulbs for 6-8 weeks before planting. This encourages them to bloom earlier. Purchase a mature plant and slip it out of its nursery pot and into a larger container. Look for healthy roots and fully formed buds. These hyacinths have an absolutely intoxicating smell in the spring. 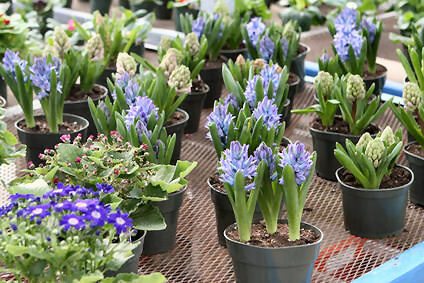 Hyacinths – nothing smells better in spring. When container gardening with bulbs, prepare your soil so it can drain easily. Loosen up your potting mix really well and make sure your container has good drainage. Bulbs need watering just like other plants, but too much moisture will cause bulb roots to rot. 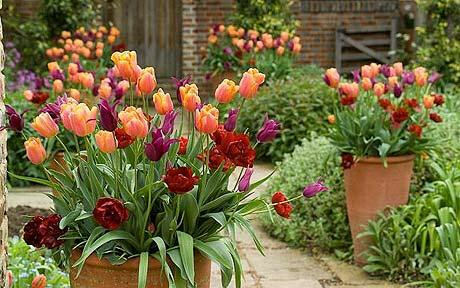 Plant the bulbs in container gardens at the right time. They need to be planted before snow or frost even if they are going to winter in a garage or shed. The bulb has to have time to take root during the winter so it will be ready to bloom in the spring. Plant bulbs in container gardens at the right depth – check out the directions that come with the bulb to see how deep they need to go. Layer your bulbs according to the depths they need to be planted and you will have a longer blooming container garden with variety and color. If someone gives you bulbs and you are unsure of depth, a good rule of thumb is to plant two to three times the length of the bulb itself. Always plant the bulb with the pointed side up and the roots toward the container bottom. Plant the bulbs in clusters for maximum impact. Water after planting, making sure you water deeply enough to reach the roots. Continue to water adequately, but don’t overdo it – you don’t want the bulb roots to rot.